WAFFLES: What's in the box, Boss? KATIE: Haven't you ever seen fresh cat grass before? WAFFLES: Boss, is that stuff legal? WAFFLES: Are you going to share? Are you? Are you? KATIE: Seriously, Waffles. Try to control yourself. We're so tickled (are cats ticklish?) 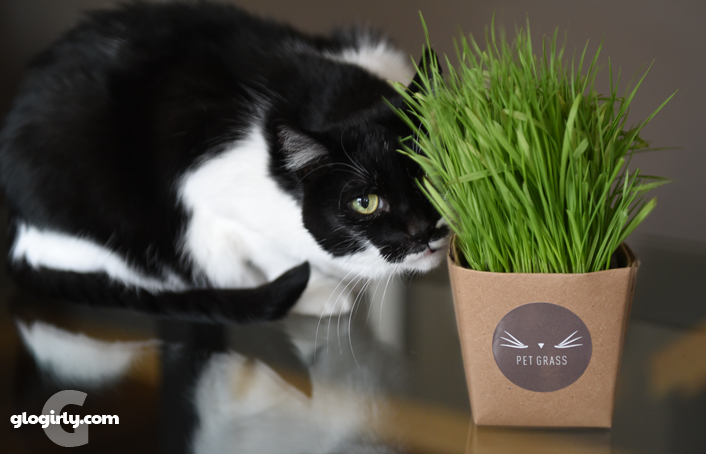 to introduce you to Whisker Greens from Pet Grass®. These delectable little pots of certified organic wheat grass are sold as a 3-pack and arrive at your doorstep completely grown, sealed for freshness and ready to enjoy. Just unpack and place in their decorative containers. Each pot of pet grass will last up to two weeks and requires just the tiniest spritz of water a couple times a week. Their life can be extended by keeping them cool in the refrigerator, though they certainly love the sunlight too. We've been hearing a lot lately about the benefits of just a little bit of green in our diets. As cats, we're obligate carnivores. Glogirly feeds us a species-appropriate, all-protein whole-food diet. In other words, our daily menu is as close as we can get to what cats would eat in the wild, without actually being in the wild. And there's grass out there in the wild! Many cats love to chomp on a little bit of the fresh green stuff and we think this might be a perfect addition to our regular diet. A little bit of grass is not only fun to play with, but each nibble contains nutrients like vitamins, minerals, fiber, amino acids, enzymes and antioxidants. 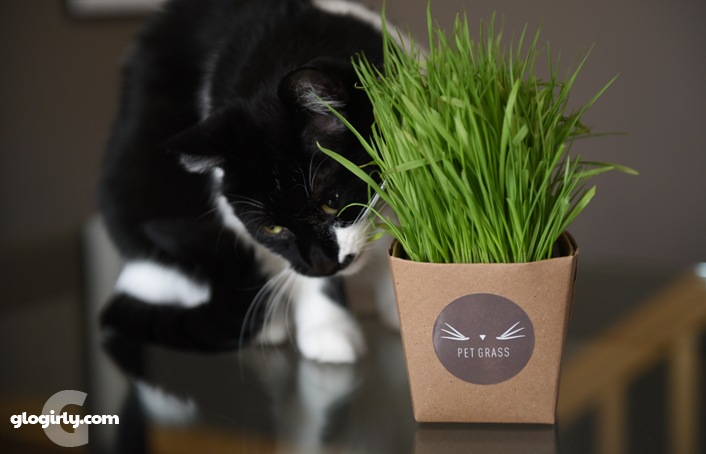 And cat grass is far healthier and safer than munching on those tempting houseplants or the grass outside in the yard. We're very excited to let the nibbling begin and promise to let you know how it goes in an upcoming part-2 installment. How Do They Grow It? 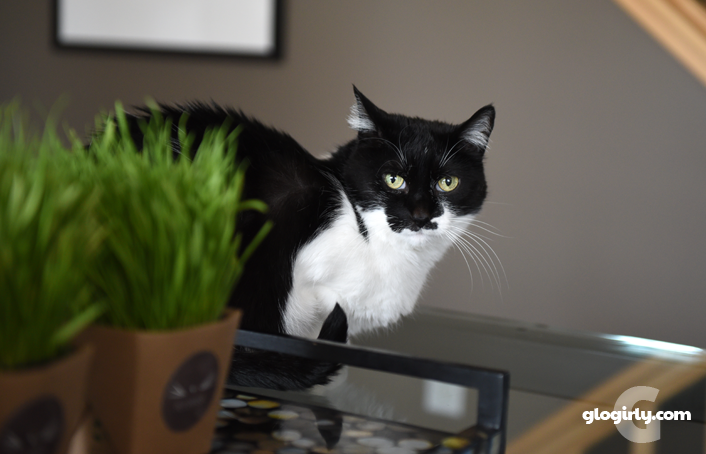 All of the Whisker Greens pet grass is grown from 100% certified organic seed. It's planted by hand in real soil so it holds onto all those nutritional benefits. The little seeded pots are rotated through their greenhouses to receive the appropriate amount of water and sunlight so they're ready to ship at just the right stage of growth. We were a little skeptical about something fresh and growing arriving via UPS. 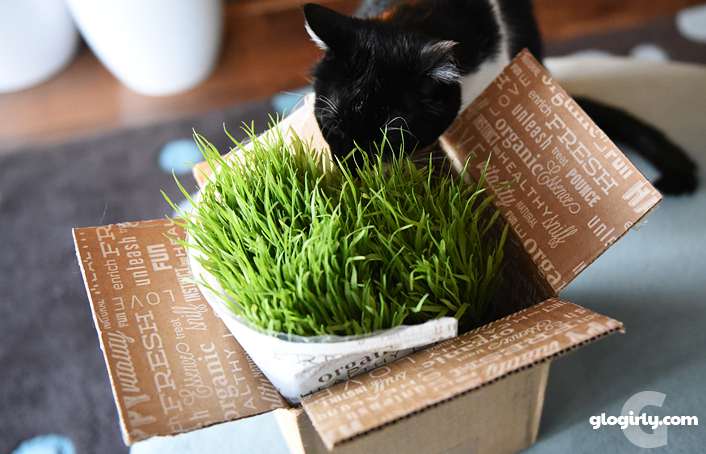 But our cat grass arrived in perfect condition, sealed in it's airtight bag inside a well packed box. It was fresh, hydrated and incredibly tender and soft. Much more so than grass you might find outside or even other edible grasses we've seen. It's very pretty and adds a fresh touch of green to the townhouse. Especially now that the leaves have fallen and the calendar is telling us that winter is coming. In just a few weeks, after we've had a chance to do some important taste testing and grass romping, we'll be sharing our experiences with you and reviewing the actual product. Word on the street is there's going to be a video starring both Katie and Waffles. And you didn't hear this from us, but they are rumored to have touched noses while the camera was rolling. This must be some magic grass! Harry wants to know if you are getting fresh gopher. If not he'll send you some. The Farm cats eat a lot of grass. I won't mention how I know that. I've been buying cat grass every two weeks from my local store. Having it delivered will be so convenient and having some extra around the house will be popular, I'm sure! Thank you for the discount code! 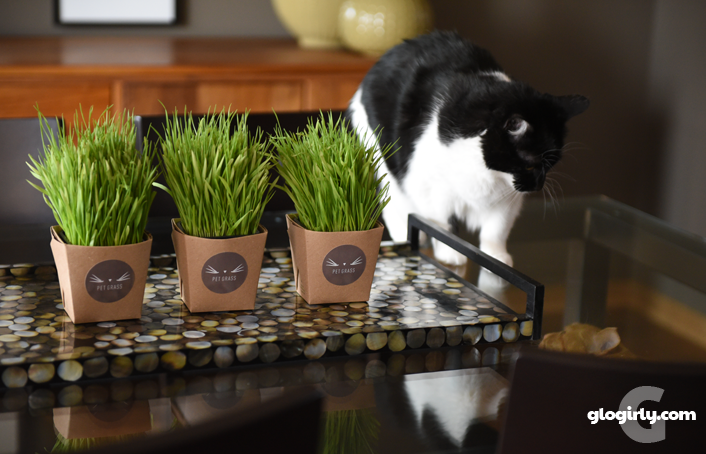 We are enjoying our cat grass too! Our outdoor cats LOVE grass!!! Oh, that looks tasty! And we love the idea of not having to grow it. The head peep has a black thumb and doesn't have a good track record for growing plants from seed. You know, we all love a bit of cat grass. We pull it out of the pot and drag it around on the floor. It's way fun. Awesome! I would love this! I do miss my greens from my time outside. Meowm has brought this plant in she calls petunias, but she doesn't like me messing around with them, even though they are not poisonous to us kitties. Maybe one day Meowm can get me some of these delicious greens! It is good, Katie? Is it? I won’t go near my grass. TW is threatening to smoke it. I love eating grass outside in my yard. But siince I have no toothies, basically I pretend I'm eating it. But I spend a lot of time trying to eat it. M said maybe she'll have to treat me this winter since my days of going outside now are over. I love the outdoor grass. I usually pick the tender shoots, but when I have my "off days" I find the longer tougher stuff and have a good yak. Mmmmmm We luv furesh gwass. Betcha' GloGirly isn't gunna be as thrilled wiff yous new grass as y'all awe, but hey, it's good fur ya', so she'll have to get used to it huh? MOL enjoy. Mum has a green thumb, she grows her own. It looks like Katie has claimed that Whisker Wishes plant for her own. 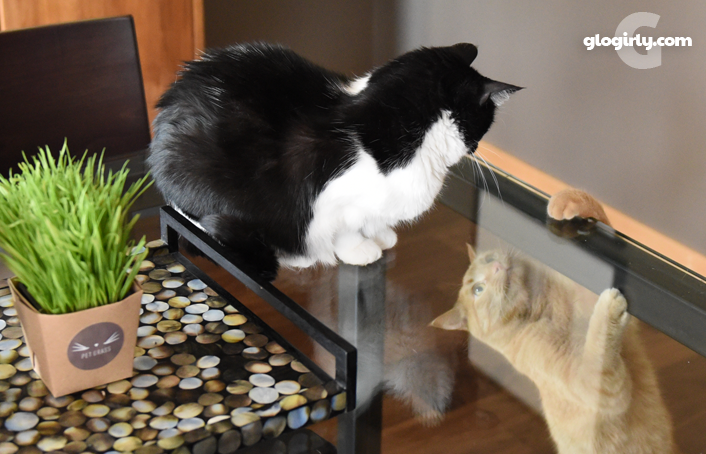 :) Cinco and Manna are loving their Whisker Wishes too! This is a great treat. Love the pictures! 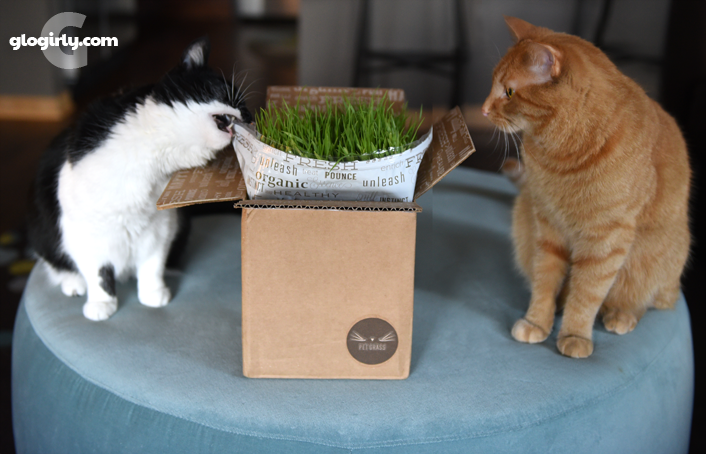 Your cats have really taken to Whisker Greens! OH boy, Katie is already addicted! I don't know if catnip is even legal Waffles! That stuff is potent! My Ben chews the bag before I even open it. That grass looks legal. I hope it's legal in Canada because kitties here would love it. No more going in the backyard with mommy until spring! :( they only ship to USA.